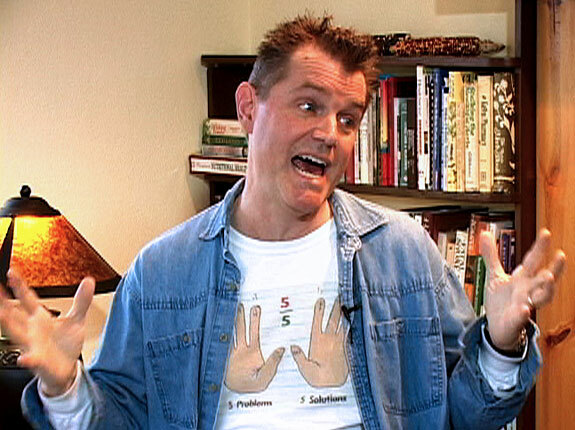 Filmmaker Jon Cooksey is one funny guy, even while presenting the most serious problems facing humanity. In this fast-paced conversation, he gallops all over the map with five big problems, five big solutions, and a playful and heartfelt approach. Wacky, sobering, full of animations, with Jon in dozens of personnas, “How to Boil a Frog” is a film to view and discuss with friends. Episode 187. [www.howtoboilafrog.com]. LOVED the movie because it puts the symptoms/problems into a REAL perspective. It is empowering, because some solutions are suggested that I can implement myself, instead of changing a few light bulbs and generally feeling helpless to do more. Truly entertaining and therefore riveting in a way few documentaries are. The one movie EVERYONE should be watching… and not just once. Many thanks to Jon and his army of volunteers. Thanks to Peak Moment Television for having the wisdom to offer this great ‘behind the scenes’ interview. That movie should be shown to all schools of all ages in the world as the future of civilization lies with the present. Education is key to changing our life bulbs.